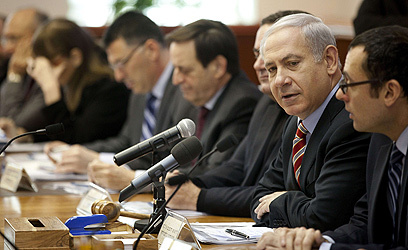 Benjamin Netanyahu is the current prime minister of Israel and head of the Likud Party. He was the first to be voted prime minister via direct elections in 1996, and later served as the foreign minister and finance minister under Ariel Sharon. Born in 1949 in Tel Aviv and raised in Jerusalem, Netanyahu is the middle child of Zila and Prof. Ben-Zion Netanyahu. Between 1956-1958 and again in 1963-1967 the family lived in the United States. In 1967 Netanyahu returned to Israel and joined Sayeret Matkal – the IDF's elite Special Forces unit. He graduated officers' training with honors and later received a special commendation as company commander. He left the IDF in 1972, returned to the US and began his studies at the Massachusetts Institute of Technology. When the Yom Kippur War broke out in 1973, Netanyahu returned to Israel and joined the forces fighting in the Suez Canal and the Golan Heights. When the war ended he returned to Boston, where he got his Bachelors' Degree in architecture, a Masters in Business and went on to study political science in Harvard University. During his years in Boston he met and married his first wife, Miriam, and became a father to Noa. After graduating from Harvard, Netanyahu took a position with a financial consultant firm and was involved in the Israeli informational activities in the United States. In 1976, Netanyahu's brother, Yoni, was killed during the Operatio Entebbe to rescue the abducted Air France passengers in Uganda. In 1978 he returned to Israel once more, taking a position as managing director at Rim Furniture Industries and forming the Jonathon Netanyahu anti-Terror Institute. That year also saw the end of his first marriage. In 1981 he married Fleur Cates and in 1982 accepted then Israeli Ambassador to the US Moshe Arens' proposal to become deputy chief of the Israeli Mission to Washington DC. In 1984 he was named Israeli ambassador to the UN and when his term ended, he retuned to Israel, joined the Likud. That year saw the end of his second marriage. In the 1988 Likud primaries, Netanyahu was voted one of the party's 10 leading politicians. In the unity government formed soon after, he was named foreign minister,and then a deputy minister in the Prime Minister's Office. Traveling on a flight from New York to Israel, Netanyahu met Sarah Ben-Artzi, a psychology major working as a flight attendant. The two married in 1991 and had two sons, Yair and Avner. In 1993, during an infamous prime-time interview on Israel's Channel 1 – later nicknamed the "torrid tape affair" – Netanyahu confessed to having an extra-marital affair. The confession, he later said, was prompted by what he called "the vicious attempt by one individual in the Likud to blackmail him for political gain." In March of that year Netanyahu won the Likud primaries. As head of the Opposition, he led the fight against the Oslo Accords and the IDF withdrawal from the Gaza Strip and some of the West Bank. In the political climate which followed, and the shockwaves sent through Israeli society after the 1994 assassination of Prime Minister Yitzhak Rabin, Netanyahu was blamed for inciting an already inflamed public, thus contributing to the political mood leading up to the murder. Netanyahu has always maintained that his conduct and political protest were legitimate. Ahead of the 1996 general elections, Netanyahu united the Likud with the political Right's Gesher and Tzomet parties. His campaign focused on the terror which ravaged Israel and the Right's objection to any further territorial concessions. On May 29, 1996 Netanyahu narrowly defeated Labor's Shimon Peres' bid for premiership, winning 51% of the votes. Netanyahu became the youngest politician to be elected Israeli prime minister and the first ever to be voted for the post via direct premiership elections. Netanyahu's term as prime minister was turbulent: In September 1996, he ordered the Western Wall Tunnel reopened – contrary to the recommendations of the defense establishment – sparking violent clashes between IDF forces and Palestinian security forces in the West Bank and Gaza. The clashes left 15 Israelis and dozens of Palestinians dead. In January 1997, as part of the Oslo accords, Netanyahu signed over the majority of control in the West Bank city of Hebron to the Palestinian Authority; later that month, Israel's Channel 1 reported his appointment of would-be attorney general Ronnie Bar-On was tainted, granting him the dubious pleasure of being the first prime minister to be questioned by police on suspicion of foul play. The police recommended Netanyahu be indicted, but then Attorney General Elyakim Rubinstein decided against the indictment. In October 1998, Netanyahu and PA chairman Yasser Arafat co-signed the Wye River Memorandum, giving the PA control of 13% of the West Bank. The Right's subsequent uproar led to the Knesset granting a vote of no-confidence in Netanyahu's government and the general elections were pushed up. Netanyahu sought the premiership bid again, this time running against Labor's Ehud Barak. Faced with Barak's landslide victory, Netanyahu announced he was stepping down as Likud chairman and leaving politics all together. In August 1999, Yedioth Ahronoth published an exposé revealing that Netanyahus billed the Prime Minister's Office for private construction done at their Jerusalem home. In March 2000, following a well-published investigation, the police recommended Netanyahu be indicted for fraud, bribery, breach of trust and obstruction of justice. No charges were ever filed. In December of 2000, Ehud Barak stepped down as prime minister. The Knesset passed a bill allowing outside candidates – such as Netanyahu – to bid for the premiership, which prior to the newly christened "Netanyahu Act" was available for MKs alone, but he refused to seek the nomination. 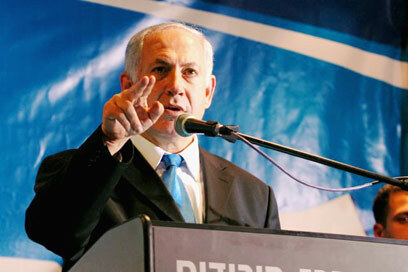 Netanyahu returned to politics in 2002, as foreign minister under Ariel Sharon. The two later competed for the Likud's chairmanship, which he lost. When the Likud won the general elections, Netanyahu was named finance minister and given extended liberties. In August of 2005, once Sharon announced the unilateral withdrawal form the Gaza Strip will go ahead, he resigned his post. In December of 2005, after Ariel Sharon left the Likud to form the Kadima party, Netanyahu won the Likud's chairmanship. In the following general elections, which took place on March of 2006, the Likud won 12 seats, becoming the fourth largest party in the Knesset. In the 2009 elections, the Likud won 27 Knesset seats and the Netanyahu was appointed by President Shimon Peres to form the new government. He took office on March 31, 2009.